Market Street Community Gardens were part of last weekend’s CCPA tour. The gardens cover a once-vacant lot on East Market Street and include raised beds full of vegetables and trimmed with flowers. Each raised bed is tended by a community member or group. Brenda Burns|Urbana Daily Citizen The Champaign County Arts Council hosted a luncheon during the CCPA tour on Saturday at the gallery space the council shares with local artist Mike Major. Pictured in the foreground are two statues framing the luncheon guests. The Longaberger house at 343 Scioto St. had a steady stream of visitors as the sun shined on the tour Sunday. Urbana was bustling this past weekend as it welcomed visitors to the 23rd Annual Historic Home and Garden Tour. The Champaign County Preservation Alliance wishes to thank all those individuals who made this happen. The event is the major fundraiser of the CCPA and without the communities’ support, it would not be possible. Not only does the event support the projects of the CCPA, but, also serves as an opportunity to “showcase” Urbana and Champaign County. The tour attracts guests from across Ohio and neighboring states, and many do return to the area to enjoy our quaint shops and restaurants – this benefits everyone! 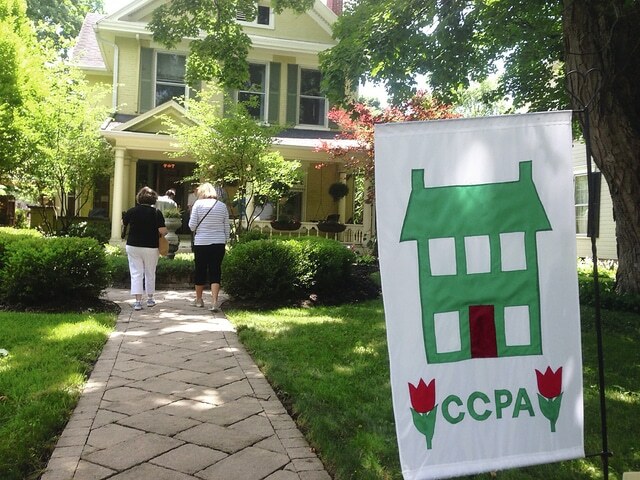 The CCPA is extremely grateful to the home and garden owners, business, the Community Gardens, Mike Major Studio, the Arts Council, and the Johnny Appleseed Museum who opened their doors for the public to experience preservation firsthand. This is a great commitment on their part and we appreciate their generosity. Thank you! The CCPA would be unable to sponsor this event without the monetary support of the entire community and we offer a special thank you to our benefactors, The People’s Savings Bank and Bundy Baking Solutions, our home sponsors, patrons, contributors and those who purchased ads in our program booklet. The hundreds of volunteers who served as tour guides, and those who drove the shuttle vans truly make this event possible. We could not offer this tour without your help – it is a community event and we appreciate your support! To Urbana Mayor, Bill Bean, Director of Administration, Kerry Brugger, the cemetery staff, and Colin Stein and the gentlemen of the street department, we sincerely appreciate your help with our banners, signs, welcome tent, the use of the city facilities and the parking lot. Special recognition goes to many volunteers, especially Pat Elliott whose help with The Preservation Shoppe set-up was greatly appreciated. The Urbana Daily Citizen did an outstanding job with the separate tab edition and feature articles both before and after the event. Our thanks to Brenda Burns, Kathy Fox and staff for their help and cooperation with the coverage of our event. Many thanks to the local auto agencies for the loan of the shuttle vans, our local florists for the outstanding flowers, Boldman’s for their work on the ticket booklet, area businesses for their advertising, pre-sale tickets and raffle prizes, and all the craft persons, entertainers and civic groups who participated. Also, thanks to the Urbana City Schools for the use of their parking lot. Our hats off to the excellent tour committee who dedicated hundreds of hours to ensure a fun-filled, memorable weekend for those who came to experience Urbana’s hospitality. They are one awesome group!